South Shields teenager Josh Corner celebrated his best result ever at the final round of the MCE Insurance British Superbike Championship at Brands Hatch – while the rest of the North boys had a weekend they would rather forget. 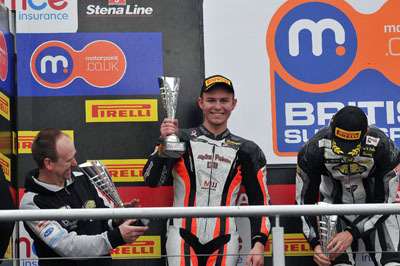 While it was all smiles and celebrations for Corner and the MJJ Motorsport team as he finished second in the Motorpoint British Supersport Cup, it was a more sedate end to the season for Supersport Championship runner Graeme Gowland, Superbike star Barry Burrell, and newly-crowned Triumph Triple Challenge champion Chrissy Rouse. As the series finale arrived at the Kent circuit, wet weather on Friday made for a difficult time for everyone as they got to grips with the slippery track. With many riders taking to the track for their first race on Saturday, the wet weather continued.